27 July 2016, at 12:00a.m. 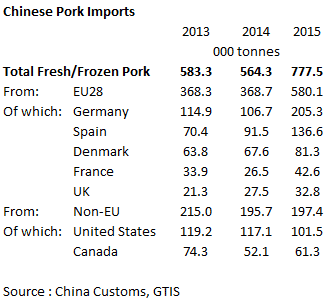 CHINA - Chinese imports of fresh/frozen pork continued to increase significantly in June, up 138 per cent to 762,000 tonnes. Chinese pork imports have been booming through 2016 to date. Following last year’s rationalisation of the Chinese breeding herd, domestic production has yet to recover. Strong environmental barriers are preventing producers from entering the market, or expanding, and some smaller producers are being squeezed out. This has led to the pig price in China reaching historic highs, despite authorities trying to ease the situation by releasing government stores of pigmeat onto the market. Therefore, this has presented opportunities for major producing countries, to capitalise on both increasing demand and increasing prices. In the first six months of 2016, the EU has provided over two thirds of the imported pork, and this more than doubled to 528,000 tonnes on the same period a year earlier. Volumes were up from all member states, with Germany shipping the most pork to China. However, Spanish volumes were almost 2 ½ times greater than 2015 levels, and are now only slightly behind German levels. Shipments from non-EU countries were over 2 ½ times up on the same period a year earlier. Just under half of these were from the United States. Both Canadian and Brazilian shipments were increased significantly on the year earlier, with Canadian imports recording a four-fold increase and Brazilian imports surging to over 26 thousand tonnes from a standing start last year.